A temporary public art piece that explores the ever-changing nature of the built environment—what remains or is erased over time, and what future possibilities may be. 405 Washington Street, Dorchester, is the site of a house that was built in the late 19th century and went under foreclosure and demolition in the 1970s. Since then, the lot has been city-owned and unused. Inspired by the evolution of this site, Lost House both explores the past and asks questions about what could be. What happens when the artifacts of the past have been erased? What does it mean for property to pass from the hands of community members into city ownership? And how do we imagine new potential futures in these spaces? Lost House plays with the forgotten histories of the site, while proposing the new. The sculpture is like a house, and yet is not a house. Painted on the surfaces facing Washington Street only, it evokes the iconic house from the front, but loses this familiarity as one walks through and around it. 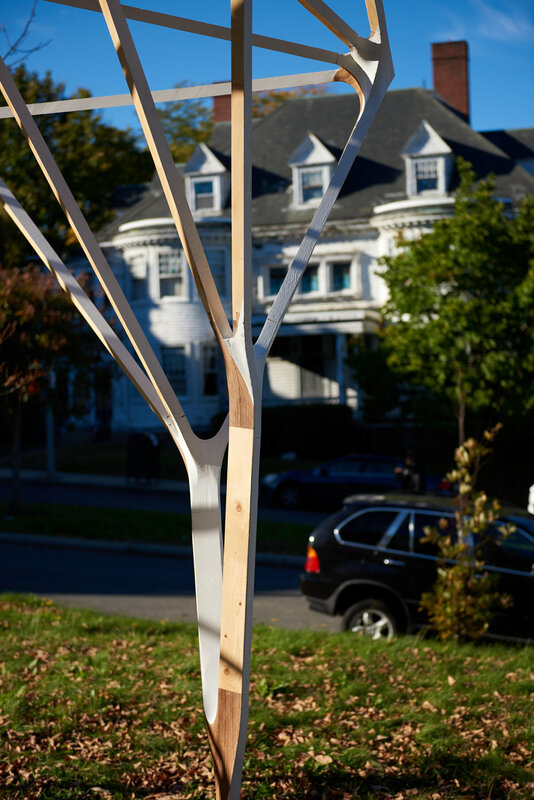 The structure itself is built of conventional lumber (2x4s, 2x8s), but these, the typical components of wood-framed houses, are joined in a new way, with custom-milled wood nodes that create branching connections: the materials of the residential, transformed. The branched forms challenge this legibility, perhaps evoking the crafts taught at the South End Industrial School, perhaps estranging the structure from the domestic altogether. A communal bench transforms the traditional center of domestic life into a shared space for the neighborhood. The footprint of the original house is drawn onto the grass in lawn paint, and will be allowed to fade over time, disappearing during the project’s lifespan. Wildflower seeds have been scattered along this perimeter, in hopes that the spring will see this outline emerge again. The structure flickers between the familiar and the odd, the traditional and the new, the private and the communal. This project is both a tracery of history and a proposal of the future, an object that stands alone but grows richer through the narrative of its site. Lost House extends that evolution into its next chapter, if only temporarily, offering the land back to the neighborhood’s use.